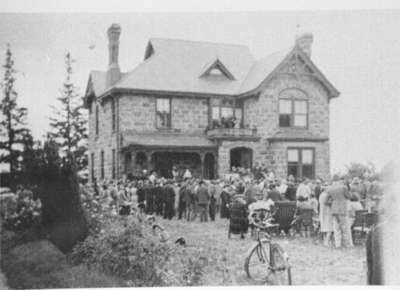 Black and white negative depicting a photograph of an auction at the former residence of Jeremiah Lick. A large group of people are facing the front of the house. There is a bicycle in the foreground. The contents sales were held on August 24 and 31, 1946, two years following the death of Adelina Jeffrey (nee Lick). The 24 August sale made $2500 and the 31 August sale made $1000.